Honoka is a clerk who’s been working at a flower shop for a year. She’s very cheerful, energetic and hardworking, but there are times when she feels bored and wishes she could just take it easy, like cats do. One night, when she visits the park she normally goes to, she meets an odd-eyed black cat to whom she jokingly says she wishes she could be one herself. The black cat grants her “wish” and tells her she’ll now be a cat from now on, though only at nights. Honoka is told that there’s only one way to break the curse: kissing someone she really loves. Thus, her life as a human by day and cat by night begins…Will Honoka be able to break the curse? Takuma is Honoka’s boss and the manager of the flower shop. He’s very kind and always with a smile on his face but, surprisingly, also very distant. Honoka admires him greatly, but it’s only when she turns into a cat that she’s able to see his real self. The truth is Takuma is a very lonely person who has trouble getting close to people due to his past; it’s also implied that he’s not on good terms with his family. Because it looks like he could use some company, Honoka decides to visit him every night and slowly starts getting to know him. At first, she’s a bit sad that Takuma only really open ups to her while she’s a cat but, soon enough, he starts inviting her out on dates. Not only that, in fact, during one of Honoka’s chill “cat nights”, she learns that Takuma has a big crush on her. The problem is he feels unworthy of her, so much so that he believes he doesn’t deserve to have a girlfriend nor a family. The reason for this has to do with his middle school years. Like I mentioned before, Takuma has a complicated family situation but he used to be really close to his grandma, who’s actually the one who introduced him to the world of flowers. Unfortunately, she passed away when he was in middle school and Takuma became a yanki. He caused trouble everywhere he went to the point of hurting a person enough that they couldn’t do the sport they loved anymore. Fujimoto’s dad is the one who makes him come to his senses when he tells him that people are always watching. This made Takuma think of his grandma and improve himself to become a better person. Of course, Honoka doesn’t mind his past since the past doesn’t define anyone as a person, so she even takes the initiative to invite him on a date herself in order to cheer him up. This route has a lot of adorable moments and very good pacing, it was really nice to see how Takuma and Honoka slowly opened up to each other. I loved how Takuma wasn’t what he seemed: in the beginning, he was very shy to the point of being embarrassed by an indirect kiss 😆 but, later on, he became bold enough to ask Honoka what was her type of man and even suggesting to carry her like a princess 😆 (Takuma’s hobby is working out so he’s very strong); he even gets super jealous at times! You really can’t judge a book by its cover. We also get a neaaaaat glimpse of Takuma’s yanki-self when he saves Honoka from some thugs almost at the end of the route. I was fangirling so much with Soma Saito’s voice acting, god, I seriously hope he gets more roles in otome games cause his voice is A+. This is something that happens in every route but, at one point, Honoka starts to notice that she’s changing into a cat much faster than before. Soon enough, the odd-eyed black cat makes an appearance yet again and tells her the curse is getting stronger: if she doesn’t act fast, she’ll remain a cat forever. Of course, Honoka panics but she’s unsure of what to do because, even though it’s pretty obvious that she loves Takuma, she’s still not sure if that qualifies as “real love”. Fortunately, everything goes well in the end and, after breaking the curse with a kiss, they start dating and even adopt a cute little cat together. The normal ending is also a good one but, unlike the happy ending, it doesn’t have as much content. Kohei is Honoka’s childhood friend, an awful cook and a biiiiig cat lover who even has a member card to a cat cafe 😆 . While this route had a good number of cute and funny moments, like the times where Kohei took care of cat-Honoka (seeing her enjoying cat food was hilarious), I think it had a lot of problems. First of all, there’s the inconsistencies. At first, Kohei hides how much he loves cats from Honoka because of something that happened when they were kids: Honoka and Kohei used to take care of a cat and her kittens but, since they couldn’t have pets at their respective homes, they made a promise to marry in the future and take care of the cats together. However, due to the cats being strays, they’re eventually taken to a shelter, which greatly hurts Honoka and Kohei both. Honoka doesn’t remember about this in the beginning, though, so Kohei tries to avoid making her meet cats (and pets in general) to “protect her memories”. The reason why I say this is an inconsistency is because Honoka is more than okay with cats; after all, she plays with and feeds them a lot during the prologue so it doesn’t make sense that Kohei would think she still avoids them; and, to be honest, I think he overreacted…I mean, how old does he think Honoka is? There’s also the matter of misunderstandings: a numerous amount of times, Kohei gets the wrong idea about Takuma and Honoka being together and, honestly, it got frustrating to the extent of being ridiculous. It goes as far as Kohei misunderstanding Honoka wanting to marry Takuma in the happy ending. Really, Kohei? ಠ_ಠ Be more mature, for pete’s sake. What I did like a lot about this route, though, is the matter of Honoka and Kohei not being sure of their feelings. In Honoka’s case, it makes sense considering she only gets to see a different side of Kohei when she’s a cat, while he’s more dishonest when he meets her as a human (and I can’t blame her, really, I also prefer Kohei when he’s with cat-Honoka). In fact, she even starts to wish she stayed a cat more often, since she wouldn’t need to think about her emotions that way. I could really empathize with her feelings because I too, sometimes, have this problem of not knowing whether I have romantic feelings for a guy I care about or if he’s just a friend. It may not look like a big deal on the outside but, believe me, feeling like that is unsettling and scary. When it comes to Kohei, I was pleasantly surprised too since, usually, childhood friends in otome games are 100% sure about their love for the protagonist, which wasn’t the case here. These two even thought of each other as brother and sister at one point, so I can get how it may have been hard for them to understand their own emotions. Like I said before, not understanding your feelings is very scary; indecision always paralyzes you and makes you afraid of hurting others and getting hurt yourself. 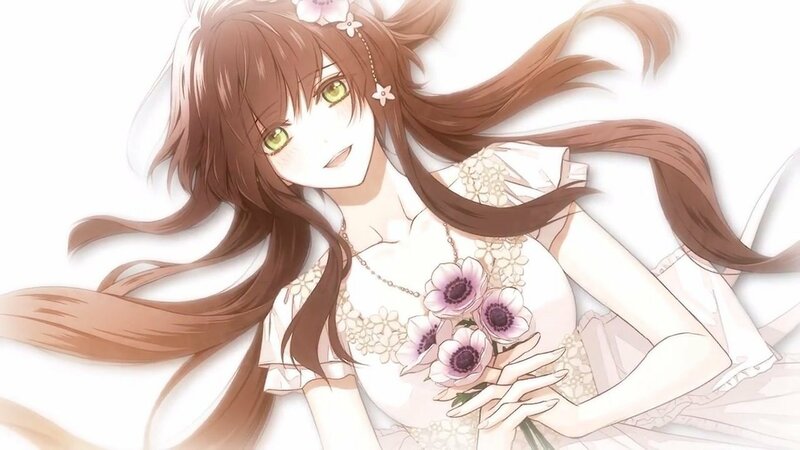 Still, I actually liked the normal ending more than the happy one, not only due to the misunderstanding issue but also because I personally think getting engaged when you just started dating someone is a bit too rushed. Fujimoto is a police officer who, at first glance, looks like someone who’s curt and intimidating but, in reality, is a really kind and caring man who’s also very shy, clumsy and a lover of cats and cute things 😆 (in fact, his hobby is collecting cute stuff). The poor guy is often found scary by certain kids and animals due to his looks but he’s so endearing that he even talks politely to cats 😆 (he can catch criminals with no problems too, though). Honoka quickly sees this side of Fujimoto when she’s in her cat form and finds him so adorable that she starts visiting him more often in order to get to know him better. Because she gets a glimpse of his real self, one day, when Fujimoto goes on patrol to the flower shop, Honoka tells him he should be more confident about himself. This sticks with him since, despite being a hardworking and kind man who’s very good at his job, Fujimoto is very insecure and self-critical. Fortunately, that comment from Honoka influences him in a good way and, from that moment onwards, Fujimoto becomes a regular at the flower shop, not only to patrol the area but also to buy flowers for his home (and, obviously, to see Honoka as well). Gosh, the relationship between these two was so cute that I was smiling the whole time while playing this route! The development felt very natural and it was super sweet to see how Fujimoto gradually began to feel that he could be himself around Honoka (first in her cat form and later as a human as well). Speaking of Honoka, she was great and very supportive of Fujimoto, going as far as taking care of him when he catches a cold and even getting mad at him at one point for always putting himself down. Sadly, similar to what happens in the other routes with the respective love interests, there are many times when Honoka has to say goodbye abruptly at the end of a date (or encounter) with Fujimoto due to her curse, something that makes her feel guilty. Things get even more complicated when Fujimoto is arranged a matchmaking party (by his father) that he has trouble declining for, which gets her depressed. Honoka’s curse is also growing stronger and the lack of rest is taking a toll on her health. Fujimoto, being the caring man that he is, worries for her and tries to help Honoka, but his kindness actually hurts her more; so she accidentally spills out what she knows about the matchmaking party and certain aspects on Fujimoto that she shouldn’t be able to know. Thankfully, after her secret is inevitably discovered, the matter is resolved in a good way. Fujimoto’s character development was handled well: it was very nice to see how he went from being extremely insecure to gathering courage not only to decide on his own and be more confident, but also to confess his romantic feelings for Honoka and, just like she did with him, accepting her the way she is, no matter the form she takes. Both endings were adorable, I really can’t decide which one I like more. I liked the happy one because it showed Fujimoto’s growth: how he became more assertive, confident and willing to decide what he wants for himself instead of trying to please his parents. And I liked the normal one a lot too because the love confession was incredibly sweet (plus the hand-holding CG is probably one of the best in the game). Kyosuke is a host who works at Club Viola and a regular customer at the flower shop due to his work. He teases Honoka a lot (especially when she’s the one in charge of making the bouquets he requests 😆 ) so they don’t get along with each other, at first. However, when Honoka meets him as a cat, she learns that, even though he has a sharp tongue, Kyosuke’s a kind-hearted man who’s very serious about his work. In fact, he sometimes has to deal with customers who make a scene, a co-worker who’s envious of him and an awful boss who only cares about money. As a cat, Honoka also learns about Kyosuke’s true passion: music. He even takes cat-Honoka to his house and performs a personal live for her 😆 so cute. It is when Honoka makes a mistake with an order from the host club (they receive too many flowers) that she and Kyosuke start getting closer; instead of abandoning her, Kyosuke is sweet enough to help her by suggesting to make an event with the flowers, even though it gets him in trouble with his boss to the point of being threatened to be fired. Luckily, the event is a big success and Kyosuke asks Honoka on a date to thank her for her help. While the date itself wasn’t that bad, I have mixed feelings about it: I don’t think I’d be flattered if a guy told me my clothes didn’t suit me and bought me something else to wear instead; I dress however I want thank you very much. Of course I left the best route for last! Saijo is an ikebana artist and one of the regulars at the flower shop. Even though he’s very gentle, Saijo carries an air of mystery that makes him unapproachable. In reality, although it’s quite obvious to guess because of the same voice and eye color, Saijo’s true identity is that of the black cat who curses Honoka at the beginning of the story. The reason for cursing her doesn’t particularly involve a personal grudge, but rather has to do with his distrust of humans in general, especially women, due to his painful past. On the first night Honoka transforms, she’s attacked by a calico cat and, when trying to escape, ends up arriving at Saijo’s house, who basically treats her like a queen with all the pampering he gives her 😆 . As expected, she feels so comfortable with him that she ends up visiting him regularly (also because Saijo mischievously mentions wanting to see the white kitty again). What’s hilarious is that the more she visits him as a cat the more she slips up stuff about his home, that she clearly shouldn’t know about, when Saijo goes to the flower shop 😆 . There were so many adorable and fluffy scenes in this route (which made me smile like and idiot) that I couldn’t get enough of them! Anyway, Honoka starts noticing that she’s getting used to being a cat and actually enjoying it so she decides to thoroughly look for the black cat to learn more about the curse. When she finds him, though, not only does he suggest she could stay as a cat but he also mentions how women shouldn’t have trouble finding love because they’re selfish. Moreover, Saijo’s initial curiosity to look after cat-Honoka starts developing into something else; he’s actually looking forward to seeing her and wants to become important to her. This also reflects in the time he spends with her human self: on top of feeling like he’s acting out of character, Honoka’s actions confuse him because she’s not like he thought all women were like. Honoka also starts to notice strange things regarding Saijo: not everyone remembers him all the time, his house doesn’t have a name plate and, sometimes, Saijo’s name would disappear completely from the order reservation notebook in the flower shop. To add to that, Honoka grows feelings for Saijo and wants to get closer to him (like inviting him on a date) but at the same time feels scared so she avoids visiting him at night and sleeps outside. Cat-Saijo worries and asks why she isn’t going to the guy’s place she usually visits 😆 . In the end, human-Saijo goes look for her to take her home and sort of confesses his love to cat-Honoka, which leaves her puzzled; though she also resolves to confess her feelings for him in her human version. The next day, Honoka visits Saijo’s house and learns of his true self: Saijo is actually a cat who once had an owner. This owner, however, suffered greatly after being left by his wife for a richer man and let out all of his resentful thoughts to his cat before dying…which turned Saijo into a nekomata. This explains why Saijo felt like love was only an illusion, at first, but spending time with Honoka made him change his point of view and even feel guilty about cursing her. Saijo’s route was so touching it had me crying at the end. The chemistry between Honoka and Saijo was amazing and there was a good balance of comedy, drama and romance. The endings were both beautiful but, of course, I prefer the happy one since the normal one is very sad. I also love Sakurai’s portrayal as Saijo, it was very fitting and made me wish I could see him in more heartwarming roles like this. It’s been a while since I last played something this adorable. While the game certainly has its flaws, mainly in Kohei’s and Kyosuke’s routes, I still think it’s very good: the story is adorable, the characters are endearing and Honoka is a caring and strong protagonist who I grew to love in no time. When it comes to the routes themselves, my favorites were Saijo’s, Takuma’s and Fujimoto’s, in that order. Oh and, speaking of order, you can play the routes in any order you want, but be sure to leave Saijo for last since his route reveals the truth about the cat curse. The music was okay, nothing outstanding, but it served its purpose well (I particularly liked the theme where Honoka turned into a cat). The art was also very cute: the character designs were charming and diverse, and I liked a lot of the CGs, even though I personally think the kiss CGs could have been better; the only real kissing CGs were Takuma’s and Kyosuke’s, the other ones were faces just being close together without the lips actually touching, which was a bit disappointing (the kissing CGs are supposed to be a reward for the player, after all). The GUI (graphic user interface) was functional and easy to use; still, I think a “skip to next choice” option would have been nice. What’s not very good is the quality of certain sounds (especially the cats’ meowing) and the way they would sometimes stop abruptly. Nevertheless, this game’s biggest flaw is the english translation, especifically the proofreading. While the translations themselves are mostly fine (there are still many mistakes, though), there are BIG issues with the number of typos, grammar, punctuation, name inconsistencies (for instance, characters calling Takuma by his name instead of “manager”, which is what they’re actually saying in japanese) and spelling mistakes present in Kitty Love. Although it’s not a big deal to everyone who plays otome games, I think it’s very important that a product tries to look as professional as possible, especially when you plan to sell it to an audience outside your country. This is because not everyone is willing to pay for a game that has a poor translation: though it may not be the intention of the developers at all, it risks the danger of looking like a half-baked job. My suggestion to DIGIMERCE, since Switch games allow to make updates on their games, is for them to hire a proofreader who’s meticulous enough to correct these mistakes and who has at least a bilingual knowledge of english. I know all of this may sound harsh, but I’m saying it not only because I feel it’s a pity to lose sales over a poor translation (the game is good, after all), but also because I feel DIGIMERCE really cares. When I received the request to make a review of Kitty Love, I was also asked questions regarding otome game fans from outside Japan (even in my country, Argentina): do many people play otome games? What are some good english websites that share a lot of game info on them? Are there otome game players in Argentina and South America in general? Do otome game players usually own Nintendo Switches?, etc. I don’t think someone who didn’t care would ask these type of questions. With all of that said, even though the translation is poor, I really recommend this game and think it’s a must play for those out there who like fluffy stories with a good amount of romance. Kitty Love will warm your heart and leave a big smile on your face. I guarantee it. Fantastic review! Oh my gosh I got so annoyed in Kyosuke’s route when they went on that shopping date. I’ve seen a few otome games where the guys almost play dress up with the MC to make her ‘better’, and it’s a cliche that grates my nerves. Like you said, I’m glad I saved Saijo’s route for last, his was so emotional, I haven’t done the normal ending yet of his, I’m a little worried how bitter-sweet it will be.